Eight serious diseases signaled by our skin. Usually, we don't think that much about our health until there's something wrong with it. A lot of the severe illnesses progress quietly in early stages. So, you find out the truth only when you visit a doctor for a regular appointment or even more horrible when it becomes way too serious. Fortunately, some health problems can be easily identified by our appearance and our skin is one of the main indicators. That is why it is so important to be aware of the signals our skin can give us. Here are the most common skin problems which can appear if there is something wrong inside your body. Did you know that in some cases even sweating can be a sign of a possible problem? Read this article to find out what other skin changes can be considered the warning bells. If you notice dark spots! Which pop up on your skin all of a sudden, this could be a symptom of Adrenal insufficiency or Addison's disease. Your Adrenal glands do not generate enough steroid hormones. Addison's disease may be caused by various factors including stress. Usually, it's symptoms come on slowly but generally, people with such disease can feel pain in the muscles and joints and lose their appetite. They have low blood pressure and low blood sugar. All these symptoms can be extremely dangerous. If you have them make an appointment with a doctor immediately. So, that if you do have Addison's disease he or she could start all the necessary procedures as soon as possible. can occur at any age and has some other symptoms besides the skin changes. Such as whitening of the eyebrows or eyelashes hair. Again Vitiligo can be the consequence of adrenal insufficiency and in some cases may increase the risk of having a skin cancer. So, if you notice some of these signals it is better to make an appointment with an endocrinologist or dermatologist to figure out what it can be caused by. Any sudden rashes on your skin show that there's something wrong with your body. It could be An Allergy to food, home chemicals, medical drugs or even a contagious disease, such as chicken pox. In any case, it is better to turn to a doctor because allergic reactions can lead to serious consequences. One of them is Stevens-Johnson syndrome, which is a severe skin reaction. The symptoms Spectre of this disease includes fever along with other flu-like signs. It takes a couple of months for people with such syndrome to recover completely. Another potential consequence is Lyell's syndrome. It's a rather rare disease but it still can be quite possible with such symptoms. Chickenpox can also be the outcome of such situations and even though it may seem like nothing much it causes a serious discomfort especially for adults. So, if you notice any strange changes in your body it's always better to visit the doctor instantly to prevent any complications. hypothyroidism. This condition can occur when the thyroid gland fails to produce sufficient quantities of hormones. also strongly signal Hypothyroidism. If you have them visit a doctor immediately. horses may also develop this disease. Be careful and don't hesitate to contact the doctor. #4 A great number of new moles and tags. 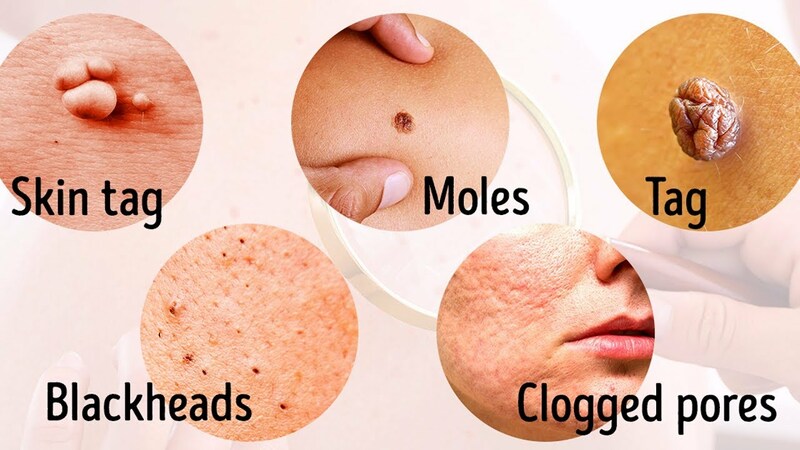 There are many reasons why moles can appear on the skin. A basic and most common one is heredity. If your parents have a big birthmark you may also have them. Other reasons can be either excessive ultraviolet exposure or hormone imbalance. In most cases moles are harmless but if their numbers grow rapidly, they are painful or they change in color in size it is a reason to visit a doctor. or tag or one of the already existing moles started to itch or bleed don't hesitate to make an appointment with your dermatologist. It's important to examine such problems right away. In case it would appear to be harmful to your health. #3 Acne blackheads and clogged pores. Pretty much everyone suffered from acne at one point or another and don't get me started on blackheads. Those things are unavoidable. Today, numerous commercials and cosmetic brands show us an unbelievable amount of products that claim to clear skin from acne and blackheads completely. And people usually trust them buying more and more without realizing that clogged pores are just the consequence and not the main reason. Of course, it's easier just to wash your face and hope it will all go away. Instead of going on a strict diet and figuring out the main root of your skin problems. But if you want to have fresh and acne free skin visiting the doctor is inevitable. There are many possible reasons for acne such as too much skin oil which clogs facial pores, hormone imbalance or digestion problems. You have to remember that acne is always a consequence. Of course, it is necessary to provide proper facial skin care. However, only a specialist will help you get rid of it entirely to have a healthy and glowing skin. In most cases, flaking is not that big of a deal. It is a temporary condition with an easy treatment, however, when the flaking is intense and in company by other symptoms, it can be a sign of a serious disease. The reasons for flaking can be a vitamin deficiency. hormone imbalance or allergic reaction. In some cases, flaking can be a sign of Seborrheic Dermatitis. It can be provoked by cold weather, stress or your genetics. possible reason for flaking may be Psoriasis, which is a chronic skin condition. It signals also include white or red patches which are suddenly appearing on your skin. Again flaking isn't in itself dangerous but when it's accompanied by some other strange symptoms it's worth seeing a doctor. Forewarned is forearmed. If you are inside a well-ventilated space with optimal temperature and you are not nervous then you shouldn't be sweating as if running a cross-country race. If you find yourself in such situations constantly it's time to sound the alarm. The reason for excessive sweating can be the toxic diffused Goiter or Graves' disease, an autoimmune disease that affects the thyroid. Among other signs of Graves disease are sleeping problems, muscle weakness, and poor heat tolerance. As a consequence, the skin becomes thinner and constantly itches. This disease may be triggered by a variety of different factors including something simple as stress or infection. If something similar happens to you see a doctor as soon as possible. your condition may silently progress. Don't put off visiting a doctor if you are feeling a certain serious discomfort. If it's nothing much then great but if there is something wrong it's better to find it in the early stages when it's way easier to treat it. Did you know about any of these signals before or experienced any of the possible consequences of them?